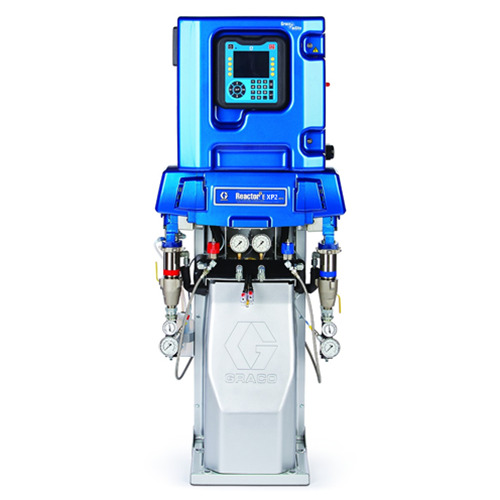 The Graco Polyurea Reactor 2 E-XP2 features up to 3500 PSI and a combination of package options to meet every demand on your jobsite. Couple that with the standard three year warranty Graco provides covering display modules, electric motor and control boards and your investment couldn’t be wiser. Reactor 2 packages feature a standard scuff guard, and have upgrades available for Graco InSite. For Xtreme wrap Scuff Guard, Graco InSite and Fluid Inlet Sensors, consider the Reactor 2 E-XP2 Elite model. With the standard Reactor 2 E-XP2, you get additional surge protection providing superior coverage ensuring that all of your electronics are not wiped out by power spikes on the job. In a power surge scenario, the piece can be easily and affordably replaced without costly damage to your equipment. The improved circuitry design can also handle fluctuations in power without interrupting applications. The spray performance remains smooth from start to finish, very similar to that seen with a hydraulic system. The advanced drum indicators notify you when materials are running low, and the easy design allows you to service your machine for routine maintenance to complex repairs. Purchase the machine only featuring the 15 kw heater, or opt for an integrated package that provides you with out of the box operation capabilities. Choose from the Fusion AP combination or the Probler P2 Package. Both include the respective spray gun, 15 kw heater, a 10 foot whip hose and a 50 foot heated hose (With a scuff guard) and the Fusion AP package includes the required Mixing Chamber. Get the results you love from a hydraulic sprayer with electric in this advanced Polyurea Graco Reactor 2 E-XP2. Contact the experts at Intech Equipment for product information, package options and any other questions that you may have, and upgrade your fleet today! With state of the art technology, an extended warranty and an industry trusted reputation, you cannot go wrong with Polyurea products from Graco.